For the politician, attorney, and judge, see Stephen Wright Kellogg. For the musician, see Stephen Kellogg and the Sixers. Steven Castle Kellogg (born October 26, 1941 in Norwalk, Connecticut) is an American author and illustrator who has created more than 90 children's books. On November 12, 2011, Kellogg was given an honorary Doctor of Humane Letters from the University of Findlay in Ohio. 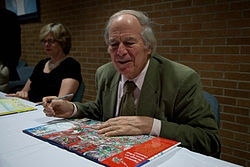 All of his original illustrations were donated to the Mazza Museum of International Art from Picture Books at Findlay. The donation was made possible in part by a $350,000 gift by close friend, Anthony Edwards. More than 2700 works of art were included. He was born in Norwalk, Connecticut to Robert E. and Hilma Marie (Johnson) Kellogg. His love of writing and illustrating led to his being accepted at the Rhode Island School of Design. While a student, he won a scholarship to study abroad for a year in Italy. Steven Kellogg is also a member of the Board of Directors of the National Children's Book and Literacy Alliance a national not-for-profit organization that advocates for literacy, literature, and libraries, where he serves as a vice-president. In 1967, Kellogg married Helen Hill. Almost immediately, he began illustrating books by other authors, and soon afterwards wrote and illustrated his own titles. He lives in Essex, New York. Kellogg's works showcase highly detailed pen and ink drawings that evolved to a singular style of watercolor and pen. His first children's book, "Gwot! and other horribly funny hair ticklers" written by George Mendoza, was published in 1967. ^ "Steven Kellogg Receives Honorary Degree in 2011". The University of Findlay. "The NCBLA Board of Directors: Steven Kellogg" Archived 2006-10-04 at the Wayback Machine. National Children's Book and Literacy Alliance (theNCBLA.org). Retrieved 2014-09-29. This page was last edited on 3 March 2019, at 01:49 (UTC).